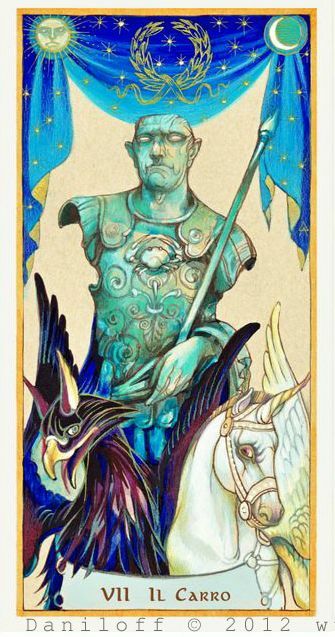 Today's Draw: The Chariot from the Daniloff Tarot by Alexander Daniloff. Is there some situation in your life you'd just love to have someone else solve for you? Is there something you're either refusing or neglecting to face? And how is that serving you and your personal development? The Chariot is read many ways. Some read it as movement, motion, a journey. Some read it as a struggle of some sort...being pulled in opposing directions. And all of this can allude to inner or outer struggles or victories of will, ego or impulse. Like the charioteer himself, we are asked to take the reigns in deciding how to apply it to a reading. We are asked to be our own source. Our own hero. Being "saved" by someone who swoops in just in time is a popular theme in books and movies. The evening news loves to milk a good hero story. And, if you're a woman, you're socialized into believing a white knight will ride in and rescue you. The theme is so pervasive that, of course, we've come to believe it...and not just believe it, but expect it. So we can sometimes find ourselves acting dormant on looming issues, expecting....hoping...that someone or something will come along to make it all right for us. I have some bad news. It's probably not going to happen. Nor do you really want it to. Because, spiritually speaking, if you don't find your way out of it this time, the problem will come around again. I can't imagine there's anyone out there who's had anxiety over making a needed life change, or dug themself into a hole they now needed to get out of, or needs to make a critical choice or any other such daunting type of life passage that hasn't once, even in passing, wished something or someone would come along to rescue them. I also can't imagine there are people out there who have never hesitated or procrastinated in the face of unpalatable inner or outer work. It's part of being human. Today's card is coming along to remind us that, if there's something like this in your life right now (and there are many such things in my own), it's time to stand up and be your own hero. Be the hero of your own story. Make a move. Be the one that saves you from this mess. What I know from my own experience in this arena is that the energy it takes to ride in on your white horse and save yourself from whatever it is that's looming over you, is nothing compared to the energy you've spent pretending there isn't an issue...ignoring the issue...fighting the issue, etc. The train is barreling down the tracks and there's no one around to untie you from the tracks. Are you going to succumb to a cruel fate waiting for someone to save you? Or are you going to at least try to loosen the knots that stand between you and ultimate freedom? Thanks for the wise words! I'm taking them to heart.